I was perusing twitter one day and saw this great picture, uploaded by Allan Carver. I quickly asked for more information and Allan was happy to oblige! Lets kick it off with a quick video to get you excited. 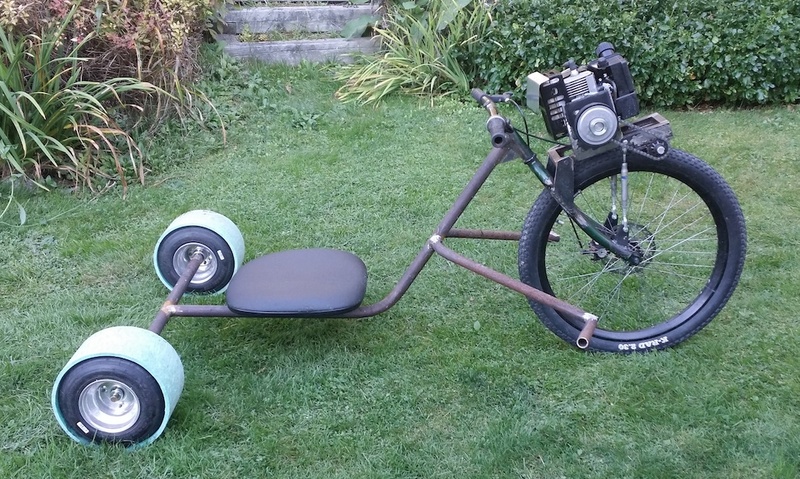 A neighbor saw me driving around on an earlier build – a homemade motorized bike – and he dropped off a 49cc motor. Earlier the same morning I saw a drift trike, and the idea came quickly to build a front-wheel drive trike. I had watched a few videos of rear-wheel drive drift trikes. But since the power wheels are also supposed to be the drift wheels, it seemed a front-wheel drive would work better. I cut the front end off a junked mountain bike, and modified the handlebars to remove the horn thingy and make it look sleeker. I got some pipe from the local scrap metal yard and fabricated the frame, which I welded to the bike front end. I used a 5/8” rod for the axle and bought two new go kart rims. The guy threw in two used tires for free. Yay. At a thrift shop, I found an old office chair for $5 and that became the seat. From the same scrap metal yard, I bought some angle iron and steel plate that I used to fabricate the motor mount. I made the mount hinged at the back and used adjustable connectors on the front so the friction drive can be adjusted easily. The friction drive itself was made from a piece of tubing with washers and collars welded to it so it. The donated motor had a 9/16” drive shaft. This was a problem. I couldn’t find a centrifugal clutch to fit. The solution was to use my mini lathe to make an adapter to slide over the shaft. This allowed me to use a clutch with a 1” bore. From there, it was a weld up a sprocket and bolt everything together. Things left to complete are to re-route the exhaust away from my face. Cough… cough… and I’m still honing in the best gear ratio, but it worked pretty good on its maiden run. Only crashed once… so far. I’m debating on whether to paint it or just clear it and add a horse skull to pay homage to Meat Loaf’s Bat Out of Hell album (for no reason in particular). We can’t wait to see the next thing to roll out of his shop, he hinted at a hubless version! Keep up the good work Allan!